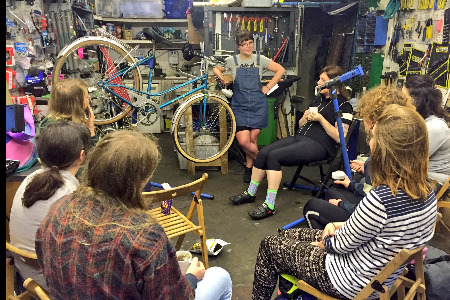 On a sunny afternoon in May, I cycled over to London Bike Kitchen from work to arrive early for my first introduction to Team WAG, LBK’s Women and Gender Variant group that makes cycling and cycle maintenance more accessible for women and non-binary people. Already set up in the small workshop was a mountain bike at the front of an audience of chatting, friendly people drinking herbal tea while waiting for the Foundation Course on Gears to begin. As a regular cyclist in London for nearly 10 years, I should have my gears in check. But being a keen cyclist, I surround myself with other keen cyclists who, to my shame, I have relied on to fix my bike for far too long. I can change an inner tube (slowly), clean my chain, and in theory I know how to tighten and change various cables, but in practice I have an inbuilt assumption that I won’t be able to fix problems with my bike myself - and so I don’t try. Gears are a clicky mystery to me that I only ever think about when they don’t work, and I have no understanding of why. That’s why a Foundation Course in Gears felt like a necessary, if slightly scary, step! The room filled up quickly and once people had taken up all the chairs and floor, Monica started with a brief history of bicycles and their gears. It was a huge relief to start right at the beginning and not just jump straight into how to fix gears, but get a full understanding of why we have them, how they developed, and how they work on different types of bikes. At the end of the workshop, participants were welcome to bring their bikes in and have someone help them to fix any of the aspects we had discussed that evening. I was too busy talking to people about how much they enjoyed it to have mine looked at, but I will certainly be back! One of the other first timers said to me, “The atmosphere was really open - and the main thing is I would never have dreamt of fixing anything myself and now I have the confidence that one day I will”. I couldn’t agree more. To find out more, visit London Bike Kitchen at: www.lbk.org.uk/wag-night/ on Twitter @LDNBikeKitchen or drop their team an email on fixit@lbk.org.uk.